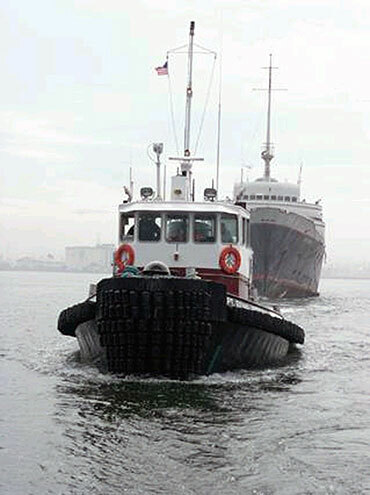 Tractor tugs and Azimuth Stern Drive tugs (ASD tugs) continue to gain popularity worldwide. Thrustmaster drives can be found on tugboats operating in ports around the world and in the United States. For instance, in Hawaii, ASD tugs with Thrustmaster Z-drives are working at Chevron’s refinery as well as in the U.S. Navy port of Pearl Harbor where they are on contract for ship handling of nuclear aircraft carriers, submarines and battleships. Thrustmaster Z-Drives offer some very unique advantages. The drives have a low profile and the input shafts are at a very low elevation. This low input shaft elevation results in lower cardan shaft angles allowing smoother operation with less vibration. This translates into less noise, less maintenance and better longevity. It also facilitates conversion of conventional drive to Z-drives in vessels where little headroom is available in the stern. See also typical ASD Tug Configuration. For conversions involving addition of a bow thruster, Thrustmaster offers some exciting options: hydraulic tunnel thrusters or low profile retractable azimuth thrusters facilitating easy installation with full freedom in selecting the location of the prime mover.